Have a new Android apps and want to share with your friends or just write a tutorial about how it works? 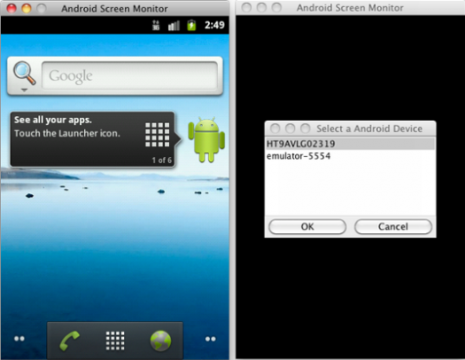 Screenshots make things easy to understand, and here’s a free Android Screen Monitor(ASM) that connects to Android SDK adb and receives frame buffer continuously on the device or emulator and transfer image to your PC desktop window. Normally, there’s a keyboard on right side of Android emulator’s screen and we need to remove it manually while taking screenshots, but ASM get rid of it automatically. The Android Screen Monitor only rotate and scaling monitor window and export a image into PNG file as screen shot tool, other actions are operating on Android device or emulator. 1 user responded in " Take Screenshot of Android Phone on PC with Android Screen Monitor "